This cute rather large engagement gift project had me die cutting and shaping flowers for hours! This is the part I enjoy most making flowers creating something so life like and detailed. As part of the DT I had to use an image from Robyns Fetish and as I had an image already thought Id use it. The Froggy is just too cute but i was stuck for how to change it from a valentines themed image into something you could use for a different occasion. Recently I had purchased a CD ROM and stamp soup set from Polkadoodles (Magic Garden), I pondered with the images for some time when I came up with the idea to use the gate and make the Froggy a tag. Once I had those ideas in my head I realized It I could make the theme like The Princess and The frog. The sentiment popped up in my head to finish it with congratulations on your engagement. 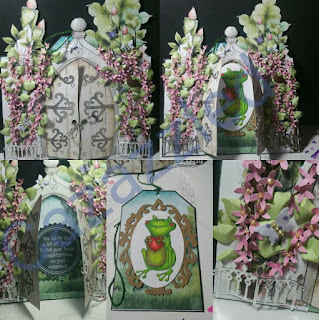 Using my Prismacolours I coloured the frog in matching green tones, die cut a Sizzix oval frame and printed a background from the cd rom to finish the tag. The ornate gate I printed out a few times so i could layer it up and get a 3d feel with foam tabs, left space so the tag could slot in and out, cut the door so they'd open and then set about die cutting the branches leaves, flowers, birds and butterflies. Using all my little die cuts I created beautiful bushes to adorn the gates with ornate fences with a small piece of twine to hold the gates together. Finally finishing with the sentiment so that when the tag is removed it can be seen " You had to kiss a lot of frogs to find your prince, congratulations on your engagement. Thank You for joining me, keeeeeep crafting. Gorgeous castle that's hiding that "prince!"